So today Nathan got a break from school in honor of Martin Luther King Jr. Jonathan got a break from work because, well it just worked out that way. Me, I went to work - those people in Nashville have to get paid, you know! Anyway, it was officially a boy's day in. 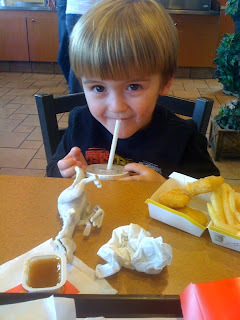 As I was working away at my desk, a photo came to my phone showing a cute little boy sipping his root beer and chowing down on chicken nuggets. I hastily reply with, "SO this is what happens when I'm not home?! You guys go to McDonald's and leave me to be the parent that makes him eat green beans with his lunch?!" He sends me back: "yep, I'm the daddy-o." Maybe I'm slightly jealous, but I'm glad these two had such a great day together. :) Happy Monday, I hope your lunch was equally spectacular!